Hi there and happy Monday to you! So, what are you up to today? It's yet another rainy, yucky day here in my neck of the woods. But, that's ok because rainy, yucky days are wonderful for staying inside and crafting away the day. I've got so much going on in my craft corner right now (I'm so glad that you can't see the mess). 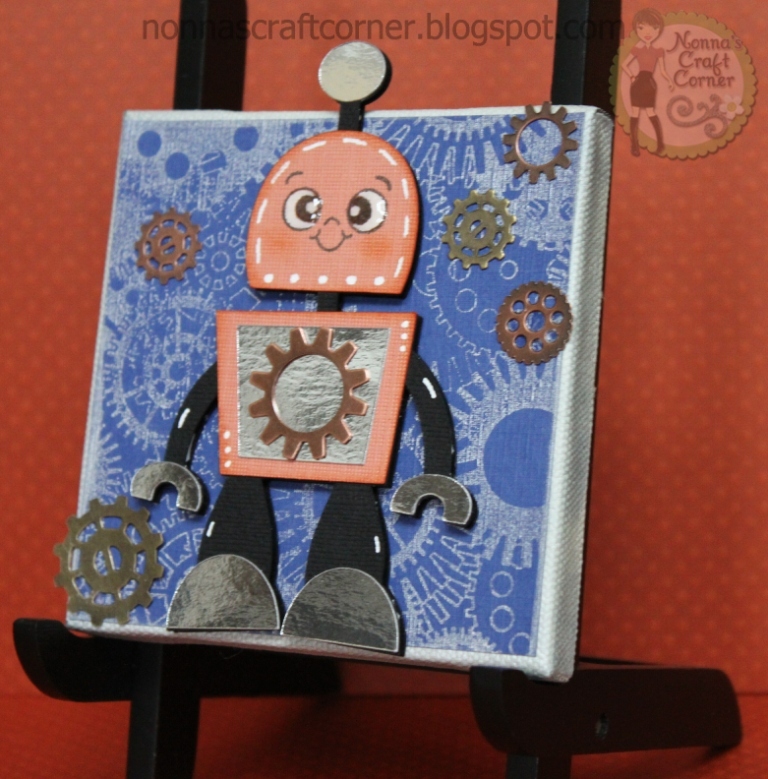 And, I'm having so much fun because I'm playing with the newest images from Peachy Keen Stamps! That's right...it's almost time for the March 2013 Release and you are gonna be so happy to see these little cuties, oh my gosh! Wish I could tell you more, but you're going to have just a few more days! 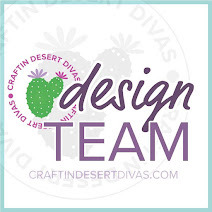 While you're waiting, how about joining in on the current challenge going on over at Peachy Keen Stamps? This one is kinda different, but lots of fun : 3D Challenge add Metal. Make a 3D creation of your choice and add something metallic. 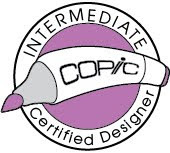 You can use metallic ink, paper, brads, embellishments, etc. Read all the rules and guidelines here. I had a tough time photographing this little guy because of the metallic paper! * I started with a small 4X4 inch canvas from Michael's and inked the edges up with Brilliance Platinum Planet Ink. 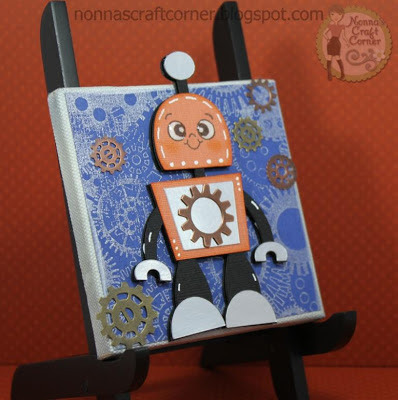 * I cut a piece of royal blue cardstock just slightly smaller than my canvas and stamped it with the "Geared Up Background" stamp from Peachy Keen. I used the Brilliance Platinum Planet ink for this step also. Then I glued the cardstock to my canvas. *The robot is from "My Scrap Chick". The file is called "Robot Valentine"
* The fun, metal gears are from the jewelry making section at Michael's and I just added a few of them here and there. Thanks so much for stopping by today and a special thanks to those of you who left such sweet comments on yesterday's post. It was a special day and your comments really touched me! So, now I'm off to play with those fabulous, new, awesome Peachy Keen Stamps...I know, I know...it's a tough job, but somebodys gotta do it! This is so cute !! Metallic colors + cameras = hard picture taking !! I had the same issue with my project for this challenge as well !! I am so excited when my little boy gets older cause his room is going to totally be robots , then I will have to borrow your idea :) And as for your weather there send that rain my way so it can melt all our snow :) hehe!! 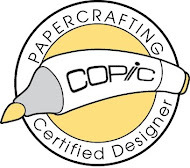 I hope you are having a fabulous day in your craft corner !! Oh how cute!! So adorable, I finished my project but didn't have a chance to post it! Okay, let's cut a deal....you show me the new "peachies" and I'll send you ooey gooey brownies... or how about chocolate covered strawberries.... Okay how about hard cold cash :) well it's worth a try :) hahahaha! Enjoy your day it sounds so inviting as I sit here at work freezing cold! I love robots! This little guy is so cute. 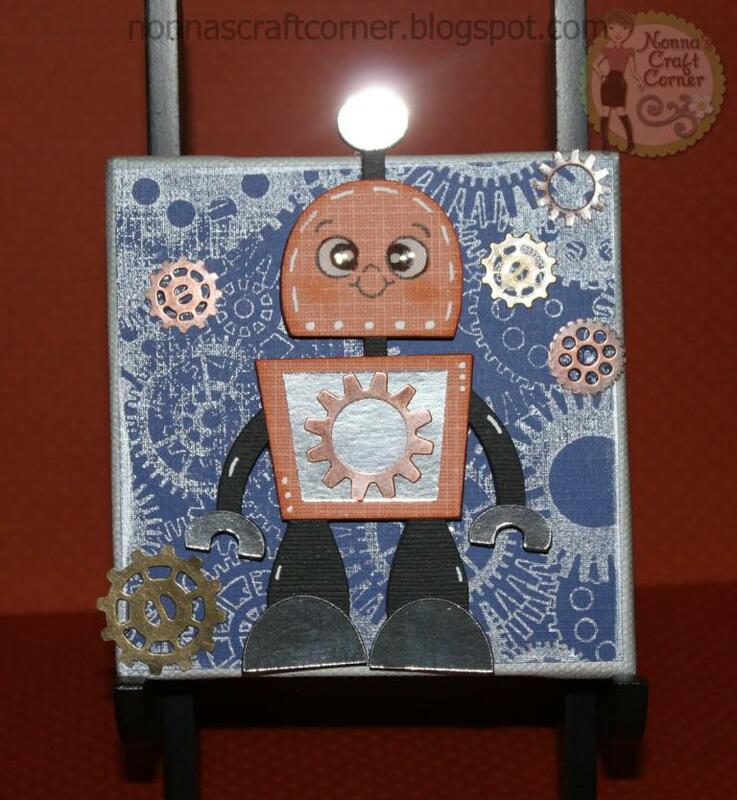 I love how the metallic paper made the little bot look like he had on a head lamp. Fun project! Tanya, your robot is fabulous! I LOVE it!!! Honey, you are rockin' those peachy keen stamps! OMG Tanya!! This is super adorable!!!! LOVE the gears, the colors and of course that adorable robot!!! Another awesome PK project! Thanks so much for sharing and have a GREAT night!! Perfect! Always a treat to see what you are making. So ADORABLE Tanya! I have been wanting to try a canvas project and have not done that yet. I am loving how this turned out! 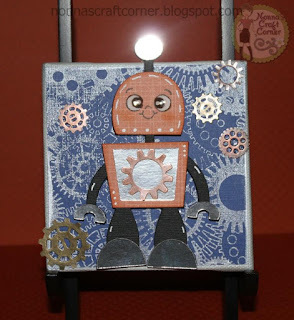 Your PK robot is fabulous! This is just too cute, Tanya. What a fabulous project Tanya!! Love the background. This is such a fun card!! The metallic paper and metal embellies are awesome!! Your robot is adorable! The big, round eyes are so sweet! Those metal gears are fabulous embellishments too! Tanya ~ Oh this is so stinking CUTE!! 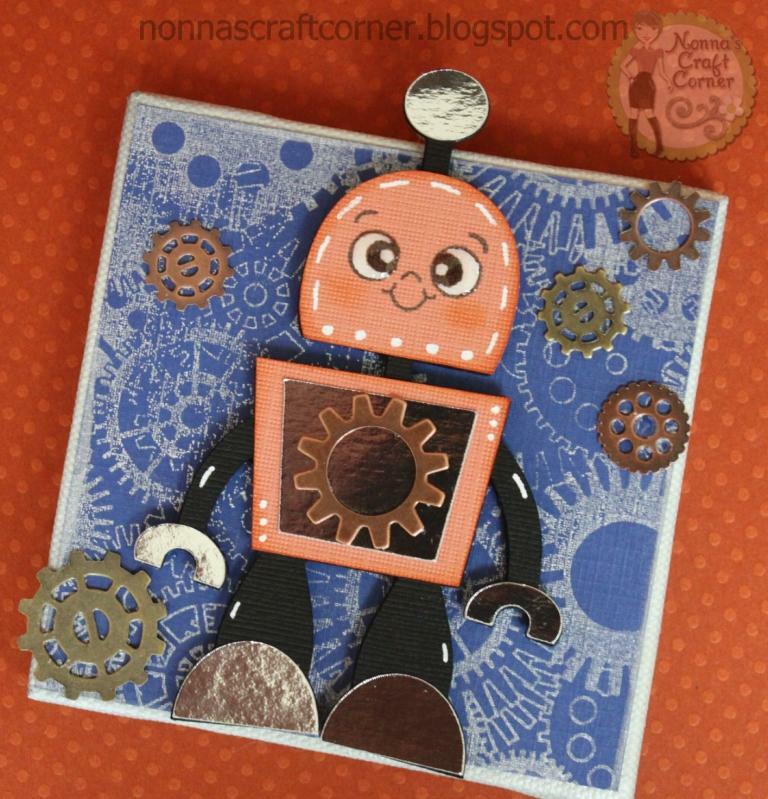 LOVE all the metallic papers you used along witht he gears!! So look AWESOME with that background!!! I have a little canvas but haven't used it yet ~ I need to pull it out! EEK alreaedy a new release! My list is forever growing!!! LOVE! This is absolutely adorable! Love all the gears! Wow! This is REALLY COOL!! !